Wedding Cake – Why is there a ceremony behind serving dessert? Have you ever wondered about the symbolism behind the wedding cake? Why does the new couple need to cut the cake together? Can’t the catering staff or family just cut some cake for dessert? Why is this a special ceremony? It’s just cake, right? Well, not exactly. According to my research, the tradition of cake actually started during the Roman Empire times as a loaf of barley bread. The groom would actually eat this bread over the bride’s head and it would symbolize his dominance in the marriage. This breaking of the bread over her head also symbolized the breaking of her virginal state. Moving forward to the 17th Century, is when the bride’s pie came onto the scene. This pie was filled with sweet bread or mince pie and a glass ring. The lady who received a piece of pie with the glass ring would be the next person to get married. The bride’s pie started becoming the focal centerpiece at weddings. Around the 19th Century is when the wedding cake as we know it appeared and the bride’s pie disappeared. During this time the wedding cake was simply a single tiered plum cake. 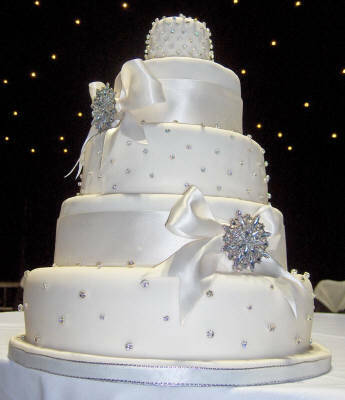 The white wedding cake symbolized purity and affluence. During the Victorian time period, only those with an excess of money would be able to afford the finest refined sugar to make the icing really white. So historically the white wedding cake was a sign of affluence. Why is there a tradition of cutting the cake together? This became a tradition and center stage because this is the first task that the couple did together as husband and wife. The firs tpiece of cake is cut by the bride with the help of the groom. Dating back to the Roman Empire time, the bride would cut and distribute the cake to her guests. Due to the size of the bridal party and guest list growing, we have evolved to the bride cutting the first piece (with the aid of her husband) and someone else cutting and serving the guests. I’m sure all of you want to hear about this serving of the cake. The tradition came from the thought that each one would serve and provide to each other as the new couple. There is no reason or tradition to smash cake in your spouses face. That is not part of the tradition. What about saving the top layer of the cake? Where did that tradition come from? This actually dates back to the 19th Century when cakes were baked for christenings. It was assumed that the christening ceremony would soon follow the wedding ceremony. The cakes were linked together with this in mind and so the couple would save a layer of the wedding cake for the christening ceremony. As the years went by, and the length of time between the wedding ceremony and the christening ceremony lengthened, the two ceremonies became disassociated with each other and took on the new tradition of eating at the 1 year anniversary. Either way it serves as a nice reminder to their wedding ceremony. So in closing, the wedding cake does have a special purpose during the wedding reception if you are a traditional kind of couple. Is it necessary to smash it on the face of your spouse? Absolutely not. There is no tradition behind that. I think someone was so nervous that they missed their spouses face and “voila” a new tradition was born for some couples.